Perhaps the most obvious benefit of riding your bike is that you get a good workout in. Whether you’re going across town, or just around the block a few times, it’s amazing to see results when you get on your bike instead. While there’s nothing wrong with jogging, or even a long, relaxing walk, cycling is much lower impact on the body. That means you’re saving your ankles, knees, hips, and other joints from the regular thump as your feet hit the pavement. So, you get all the exercise you want, but you also get to avoid aches and pains in your joints. Most of us don’t think about wear and tear on our cars, but that’s because we see it happen gradually. Whether it’s the tires losing tread, the fluids needing changed, or just watching the miles tick up on the odometer, it doesn’t happen all at once. But, the less you use your car, the longer it’s going to last you. Also, the less you use it, the less you have to spend on fuel, and the less maintenance you have to do. These are just a few physical and environmental benefits that come with riding a bike instead of driving. 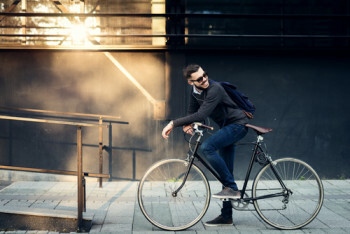 Whether it’s the ease of parking, to the ability to work out stress, why not try to work bike riding into your daily routine? For more great ways you can start being environmentally conscious, simply contact us today!